It's basically one step up from nanotechnology. Well...sort of. Okay, maybe it's not really anything close to nanotech, but it's still bloody cool. See, electronic components have been dropping in price year after year, as consumer demand for mobile development continues to skyrocket. That such a thing should happen is sort of a necessity; there's no way our technology would be able to develop at such a breakneck speed otherwise. What this means is that the creation of disposable robots - cheap, simple machines that can perform their tasks without needing to worry about losing a unit here or there - is actually completely feasible. It also means that by organizing these robots into a swarm - that's where the nanotechnology reference comes in - they can be given capabilities that even individual, complex, and expensive robots don't possess. That's pretty awesome, right? We haven't gotten to the best part yet, either. 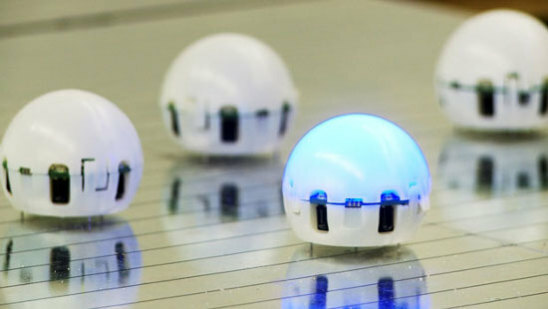 A group at the University of Colorado Boulder is funding a huge swarm of little 'bots known as Droplets (the name comes from the idea that they're "a liquid that thinks"). These tiny machines gain power from the floor through their legs, and so have unlimited running time. They're capable of omnidirectional motion, and direct communication with the user. They're range and bearing-sensing, with full body illumination, the ability to self-right, and the ability to program each individual droplet. Alright, so that's the exciting stuff. Now for the not-so-exciting reality check. The robots are only designed to work in a dedicated arena with a powered floor and support for IR communication. Within this arena there's also an overhead camera and projector system. In addition, each individual droplet isn't actually all that cheap -cheaper than larger, more complicated robots, sure, but still not necessarily set at a reasonable price for the end user. Currently, the project is looking for at least $10,000 US to construct a swarm of around 100 robots, half of which will go towards the special cast that has to be made in order to injection-mold the outer shell of each robot. As a result, if the project manages to pull in $30,000, that means we'll have a thousand Droplets scurrying around their little room. Okay...but what exactly are they going to be used for? According to CU Boulder, they have a few functions in mind. Chief among these is education: they want to use the robots to teach college-level swarm intelligence classes.They've also said the robots could be used as visual aids in high school classes, or even as artistic instruments for creative types. Last, but certainly not least, swarmbots could be used to create realtime maps of environmental disasters in order to help coordinate cleanup efforts. And in the future, who knows? Droplets could well serve as the prototype for an army of tiny cleaning bots, scurrying through the oceans and along the city streets of the future to scrub up messes wherever they find them. I'm focusing on that, because the alternative - a malevolent militarized hive-mind - is a bit too distressing to think about. Either way, one thing's clear - robots are gonna start swarming, whether we like it or not.